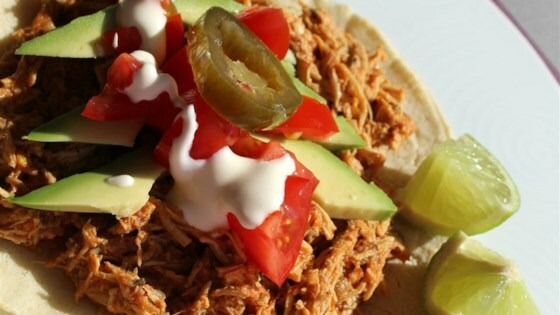 "This spicy and sweet shredded chicken can be used in many different Mexican dishes. I love it on crunchy tostadas. This is a great recipe to make ahead and freeze for a quick dinner option during the week. Level of spiciness will depend on the salsa brand you use. You can use straight chipotle peppers from the can, but be prepared for blazing hotness! If you can't blend the mixture, that's OK; just chop everything up very small, it will break down a little more once you cook it. Serve on tortillas or chips. Garnish with lettuce, tomato, onion, sour cream, or guacamole." Bring a saucepan of lightly-salted water to a boil. Reduce heat to medium-low. Cook chicken in simmering water until until no longer pink in the center and the juices run clear, about 20 minutes. An instant-read thermometer inserted into the center should read at least 165 degrees F (74 degrees C). Transfer chicken to a cutting board and tear into shreds using 2 forks. Blend stewed tomatoes, chipotle salsa, and apple cider vinegar in a blender until smooth. Combine shredded chicken, blended sauce, and onion in a saucepan over medium-low heat. Cook at a simmer until the onions are translucent, about 10 minutes. Season with salt and pepper. I thought this chicken was just ok. I did add some bay leaves and ground oregano. Not sure what went wrong but I probably won't make this again. Sorry. i had to triple this recipe, we have 6 children, and everyone loved it. it was easy to make, fast and to have a dish that pleases everyone is priceless.